No. 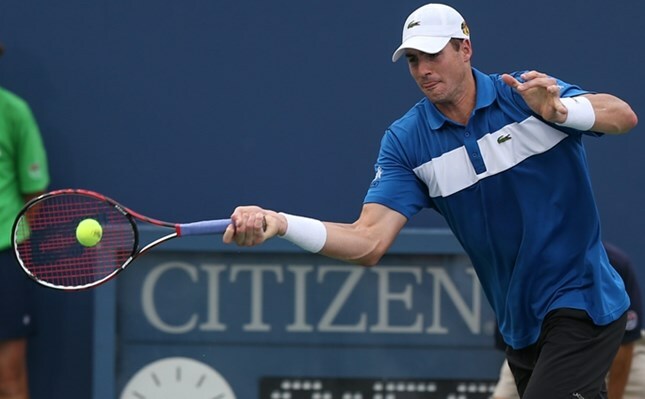 1 seed John Isner narrowly passed through his quarterfinal match, beating Radek Stepanek 7-6(3), 7-6(7). Though the match proved to be close, Isner's home advantage and serve nudged him in favor of both tiebreaks. There were a lot of factors going into the match that weren't necessarily just about points and plays. For one, there were several rain delays that interrupted the match, naturally breaking both players' strides. Also, American Isner admitted, "I was a little nervous. I haven't played on hard courts in a while and I was nervous about my first match here." This showed as Isner blew a couple of unforced errors, granting Stepanek an early break in the first set. In the meantime, Stepanek had to face an unforgiving audience. So, when the time came to a 6-6 tie in the first set, Isner gained control and won the tiebreak 7-3. Another large component of Isner's win was his serve. Though Stepanek relied on finesse and moving the ball around in the first set, Isner dominated by firing away serves that flew by as fast as 141 miles per hour. Isner served from 96-135 miles per hour on his 33 aces, the most he’s ever served in a two-set match in his career. The players' tactics changed as the second set went underway. While Stepanek attempted to switch things up by playing a strong service game. Isner grew steadier and started hitting speedy winners down the line. This trend surfaced at 5-4, 30-40 when Isner confidently put away a tough shot from Stepanek with a resounding thud. Isner also continued to serve aces, gaining the important points and causing another 6-6 tie. With this switch up on both players' parts, the points grew longer and the crowd more vocal. The majority of Stadium Court proceeded to scream out, "USA," as the second set tiebreak began, giving Isner the strength he needed to close out the final set 7-6 (7). Since 2012, the former Georgia Bulldog is 12-1 in tiebreaks at this tournament. In closing remarks to the audience, Isner gave credit to the crowd for granting him such a strong home advantage. "I had the crowd on my side. It helps more than anyone could know." Isner will now face Ricardas Berankis in the Friday quarterfinals, which will be the third match on Stadium court.